The Bajaj V (Vikrant) series brings one of the greatest marketing ideas the Indian automobile sector has ever seen. It taps into our sense of patriotism, as the metal of the bike is made of the metal of country’s first aircraft carrier, INS Vikrant. ‘Vikrant’ here refers to the voice of pride and defines the story of ordinary heroes with an extraordinary mettle. Post the success of the quirky yet likeable Bajaj model V15 comes V12, which possesses the same basic design, a smaller 125cc heart and a promise of delivering the same riding experience as V15. The Bajaj V12 wears the same neo-retro look as its predecessor V15 and a new side strip design. The bike has confident sure-footed tyres that are widest in its segment, which now gives a new impressive wheel design. The bike sports a distinguished neo-classical tail lamp unit and a sharp headlamp unit that comes fitted with mandatory AHO feature. Other highlights include a chrome-tipped matte black exhaust pipe and smooth-flowing sideline. The instrument console of the bike does away with the digital fuel gauge and employs an economical analogue needle indicator. Other key features include a Classic LED Tail Lamp, Imposing Front Fascia, All-New 125 cc DTS-I Engine and a thunderous exhaust. Wide & large tyres with best in class road grip and stability are an additional icing on the cake. Bajaj V12 gives a mileage of 70.00 kmpl with a 124.5 engine capacity. Maximum power for this bike is 10.50 bhp @7500 rpm. You are just a click away to get your Bajaj V12 bike insurance policy. Coverfox.com offers great discounts with top-notch insurers. And, you receive the policy within few minutes of your transaction. Coverfox.com provides a complete support right from resolving your queries, purchasing the right policy to post-sales services to help you at the time of claims. Renew your Bajaj V12 insurance instantly and receive the policy within 4 minutes. Even expired two wheeler insurance policy can be renewed without any inspection. All you have to do is provide few essential details about your Bajaj V12 including the location of registration. The bike is expected to appeal to a certain class of riders who are looking to have a sturdy commuter with an efficient performance and a unique styling. The bike possesses great tires which are widest in its segment alongside an impressive wheel design. What are the features of Bajaj V12 ? Chrome-tipped matte black exhaust pipe and smooth -flowing sideline, economical analogue needle indicator and a Classic LED Tail Lamp, Imposing Front Fascia, All-New 125 cc DTS-I Engine and a thunderous exhaust. Wide & large tyres with best in class road grip and stability. What is the mileage of Bajaj V12? The claimed ARAI mileage for the Bajaj V12 2018 petrol is 57 kmpl. How to make a claim on your Bajaj V12 bike? You are just a call away to claim on your bike insurance with Coverfox.com. We have a specialized team who intimates claim on your behalf and keeps you posted with regards to the claim status. Coverfox.com claims team follows up until the claim settlement. You can also write to us on help@coverfox.com for claim intimation. 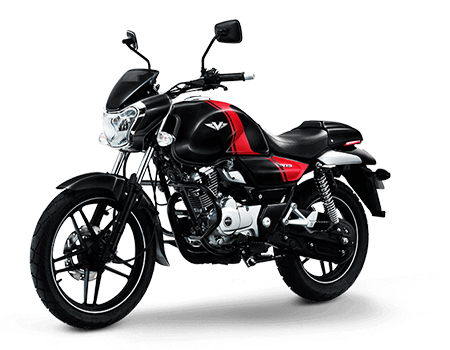 Why should you insure your Bajaj V12 bike? Insuring your bike will prevent you from any unanticipated risks in the future, in case of any accidents. Such kind of a cover takes care of the damages that will be caused by an accident. The Insurance policy will cover the owner-driver and third-party property damage. Also in case of theft, you could land in a soup and have major losses if your bike is not insured. Hence, one should compulsorily have a bike insurance policy.